The former Tottenham manager said new Chelsea boss Maurizio Sarri should stick with the Spanish forward for now, having given him the nod in their first game of the season at Huddersfield Town last weekend, but that he could not afford to keep him in the side at the expense of losing points. With that in mind, Sherwood told The Debate Morata’s rival for the No 9 spot at Stamford Bridge, Olivier Giroud, was more suited to Chelsea’s style of play – and had the benefit of being a proven goalscorer in the English top-flight. “You need to make [Morata] feel like the main man,” he said. “How long do you do it for? 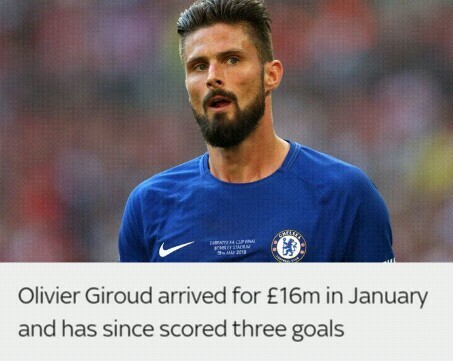 You can’t relinquish points and Chelsea can’t lose ground on the leaders, and you’ve got someone who is a World Cup winner in Olivier Giroud sat on the sidelines, who has been a proven goalscorer at Arsenal. “He’s a player who can come off the bench and score as well, he affects the game. I think he’s their main threat. If you asked the number 10s around him, like Hazard and Willian, they probably play better with him than Morata at the moment. But it’s for Sarri to get the best out of him, and maybe that’ll be what he’s good at. “He won’t give up on him, but it’s how long he gives it and he’s got someone in there like Gianfranco Zola who can help with that transition as well. They’ll be in and around him. He’s one of the best players we’ve ever seen in the Premier League, and bringing him back was a masterstroke. Fellow guest and ex-Arsenal striker Charlie Nicholas agreed Giroud had proven a more useful foil for Chelsea’s other attacking threats than Morata. He put the Spaniard’s drop in form down to a lack of faith from the Blues’ most recent manager, Antonio Conte, after his form dropped to such an extent he scored only two Premier League goals after Boxing Day last season. He said: “The first period of last season, I watched a lot of Chelsea, and Morata would battle away. I wasn’t convinced he had that quality but he did show it, and he would be on the turn and sometimes Hazard and others had to speed up the pitch to keep up because he was so positive, and gradually it worked away from him. “If you remember early in the season Conte was complimenting him all the time, he’s brilliant, he’s a great lad, he’s brilliant at this and that, but then Morata ended up shaking his head every time he came off because it was as if Conte was picking on him. “And when you’re a striker, and you lose confidence, the worst thing is when you’re getting picked on and your number’s coming up after 60 minutes every time. You know your manager has lost faith in you, and then you lose your edge.